Maximum size: 7 mm (excluding "tail"). Identification: This species has a fragile, strongly inflated, transparent shell without spiral striae. 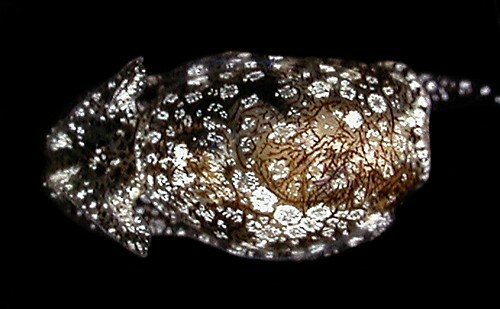 The animal is translucent cream with white rosettes and irregular brown lines that often form "lightning bolt" patterns. Occasional animals have much less brown and juveniles have disproportionately large "lightning bolts." Natural history: Unidentified haminoeid #2 is a common sand-dwelling species found in protected to moderately protected sand channels at depths of 1-3 m (3-10 ft) as well as silty Halimeda kanaloana beds at depths of 8-11 m (26-36 ft). Rarely, juveniles may be found in rocky habitats. In shallow sand channels, it appears to be an ephemeral species with very large numbers of larvae settling after periods of low surf have allowed the development of a micro-algal film on the sand's surface (presumably their food). Such populations engage in synchronized spawning, then appear to "spawn out" and die. (Note 1) More stable populations may occur in the H. kanaloana beds. (Note 2) The egg masses are greenish-yellow and cylindrical. (Note 3) They are deposited in dense patches, sometimes containing thousands of masses (though a few dozen to a few hundred are more common). During spawning, the animals can usually be found crawling among the egg masses or concealed under a thin layer of sand near them. Fish behavior suggests that the masses contain anti-feedant chemicals. (Note 4) Hatching occurs in five to six days in the laboratory. Distribution: Maui and Midway: widely distributed in the Indo-Pacific. Taxonomic notes: First recorded in Hawaii off Makena, Maui by PF in 1991. Photo: PF: Midway Atoll; May 30, 1993. Note 1: Over the years, populations of this species have appeared several times in sand channels on the inner reef flat at Hekili Point. In August, 1991 extensive patches of egg masses were seen but no animals could be found in association with them. Collected egg masses hatched in four days and all masses in the field disappeared over the same period. On April 27, 1999 extensive patches of egg masses were seen with associated animals. Several collected animals kept in an aerated container with a sand bottom laid two batches of egg masses on the mornings of the 28th and 30th (the latter noticeably smaller). Most died shortly after laying the second group of masses. The first eggs laid hatched in the evening on May 3rd. Meanwhile, all but a couple egg masses disappeared in the field by May 5th and no animals could be found. In a second basin near Hekili Point, additional patches of egg masses were seen by Darcey Kehler on April 29th but no animals could be found. On Oct. 28, 2007 several small patches of egg masses were seen with no associated animals. Most had disappeared by the 29th. Extensive patches of egg masses were seen on May 27th, 2008 but no animals could be found. On the morning of April 23, 2009, many small patches were found with associated animals. The patches were less dense than usual with the animals evenly distributed among the masses (suggesting that they may have laid their first masses the night before). On April 27, 2014 very extensive patches of egg masses were found at depths of 0.5-1 m just off the beach west of Hekili Point. Patches were ultimately found in an area of about 200 m by 20 m. Numerous animals were found on and between the patches of egg masses (in sufficient numbers that their mucous trails altered the texture of the bottom sediment). Many animals were also observed from April 27 through April 29 drifting in the water column on mucous strings (at slack low tide) with many appearing over an adjacent down-current sand patch (with few eggs) on April 29. The animals had disappeared from about 75% of the up-current patches by April 29 and from the remaining patches by April 30 with only a few lingering in the adjacent down-current sand patch. Hatching had probably started by May 2 and was largely completed in the up-current portion of the area by May 3. In all cases, the egg masses appeared after a couple weeks of unusually calm water conditions had permitted a noticeable micro-algal film to develop on the surface of the sand. Also, no animals were found in adjacent rocky habitats before, during or after the spawning events. These notes support the suggestion that the larvae settle in such locations only when their food algae becomes available, spawn synchronously, then die back. A subjective estimate of the times between the most recent surf events capable of stripping algal film from the sand channels and the spawnings suggests that the species may have a post-larval life span of as little as two weeks, perhaps less. The lower density of masses in the patches observed on April 23, 2009 and the lack of "donut shaped" patches during hatching suggest that the patches are "built up" by animals laying multiple masses (perhaps 3-4 at 1-2 day intervals) over their entire areas rather than by adding masses to their edges. Note 2: On April 15th and 18th, 2007 innumerable patches of egg masses were seen in silty Halimeda kanaloana beds in Maalaea Bay. The patches were smaller than those typically found at Hekili Point (most only containing a few dozen masses) but were scattered over the bottom every meter or so "as far as the eye could see" during the entire duration of the dives. Some had associated animals, some not. Note 3: When several animals were held together in a dish on April 27, 1999, they laid cylindrical egg masses comparable to those seen in the field. However, when an animal collected on April 15, 1997 was held alone it laid a spherical egg mass similar to those laid by other haminoeids. (see photo) That suggested that egg laying in the field might be a truly "social" behavior that required two or more animals to shape the mass during deposition. However, three animals collected on April 28, 2014 and held in separate dishes laid typical egg masses demonstrating that the previous observation was anomalous and that they do not require a "helper" to form an elongate egg mass. Typical egg masses were also laid in two dishes containing multiple animals. Note 4: On Oct. 29, 1999 foraging goatfish (Mulloidichthys flavolineatus?) were observed changing direction to avoid patches of egg masses. In addition, black durgon (Melichthys niger) and juvenile parrotfish were observed "nibbling" the eggs, then backing off. Similar observations have been made on other occasions. That suggests the masses may contain fairly powerful anti-feedant chemicals (perhaps obtained from cyanophytes in the micro-algal film on which the animals appear to feed? ).